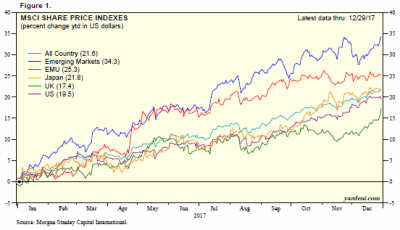 Over the past twelve months, we’ve seen the bull market continue to trudge ahead with highs in many U.S. indexes and growth in various sectors and industries. With the news of major tax reform comes optimism for continued corporate earnings strength. That said, however, there are also growing concerns regarding an overvalued market and a potential correction. 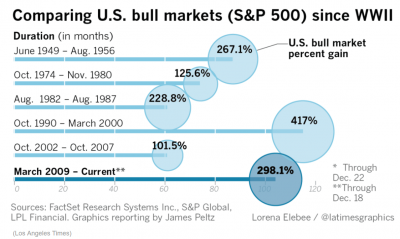 Bull markets don’t die of old age. This ubiquitous adage reminds us that a bull run won’t fizzle out unless there is a catalyst to trigger a shift into bear market territory–such as a tightening of monetary policy, a recession, or irrational exuberance on the part of investors–none of which seems to be on the horizon now. Positive economic factors have bolstered corporate earnings, which have in turn fueled stock performance. And while this could continue as the newly-passed tax reform takes hold, there are some shocks that could derail the momentum; the Fed could act more aggressively than it has signaled, for example, or there could be a disruptive geopolitical event. Having Non-U.S. Exposure is Important. Diversification is a good idea for any investment portfolio, and the global recovery we’re seeing underway means there are opportunities for investors in the overseas markets. Some of the market’s Europe-centered fears, for example, ended in a soft landing; i.e. the French presidential election results squelched concerns regarding a potential eurozone breakup, Brexit seems to have had more bark than bite, and the Eurozone has seen some of the fastest growth since March 2011. A weakening dollar could help commodity- and industry-based emerging market economies. Volatility, usually associated with downside, is not always a bad thing. Volatility has been low this year due to a combination of factors including investor sentiment, monetary policy, a late-stage business cycle, and low correlations (stocks are not moving in tandem). 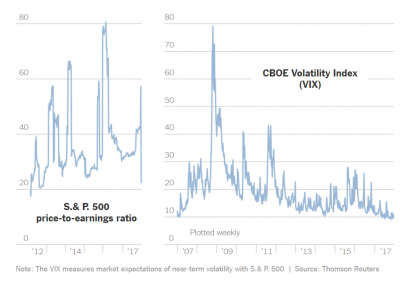 As recessionary risks continue to appear remote, volatility is likely to remain subdued. But volatility can also represent upside for the patient investor who is able to weather stock market storms. 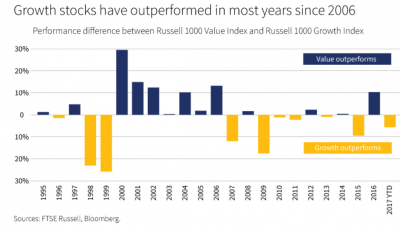 Higher returns, for example, can be a reward for investing in riskier, more volatile assets. Solid businesses may experience short periods of undervalued shared prices, and this kind of volatility allows investors to enter the market and exploit the opportunity. So, during downward swings in volatility (which we have seen this year), establishing and adhering to a long-term investment plan can serve as protection against future share price swings. These are only a few of the prominent investment takeaways from 2017, which has been an interesting year on many fronts. What’s the common denominator for the investor? Determining the investment approach that best fits your needs and sticking to it, no matter what the direction the market takes.